The Nelson Monument has recently been refurbished and Hurst Peirce + Malcolm LLP were asked to provide structural engineering support for the project. The previous occasion when the monument was refurbished was in 1987 and Hurst Peirce + Malcolm LLP also provided structural engineering support on that occasion. This continuity allowed us to compare the current condition with the photographs we took in 1987 and it was pleasing to find that the repairs had stood the test of time and that there was no significant deterioration. Part way through the project we were asked if it would be possible to make a more modern repair to his left arm where three bronze bands had been present since 1895. The stone was checked by Sandberg Consulting Engineers for fractures using ground radar and none were found. So the bands were removed and the stone cleaned up and this confirmed that there was no fracture but there was a relatively small fissure in the stone about 30mm deep. 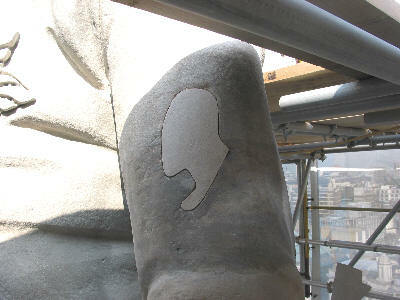 The fissure has been repaired with a prefectly fitted plug of the same Craigleith Stone used for the original statue. 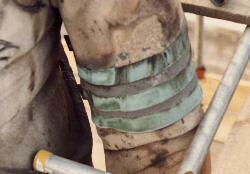 Hurst Peirce + Malcolm LLP were able to confirm that the arm was sound and the bronze bands did not need to be replaced. The bands had been fitted following a lightening strike and the report by the steeplejack at the time stated that the arm was shattered. That is clearly not the case. We believe that the fissure probably trapped moisture behind a mortar repair and the mortar was blown out by the moisture turning to steam during the lightening strike.